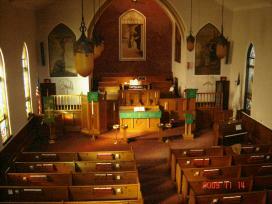 The lovely sanctuary of St. John United Church of Christ, Wyandotte, Michigan. 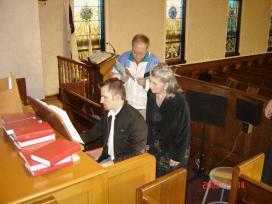 Steven Ball and MaryAnn Balduf check out the console as Terry Jankowski does the same with a church bulletin. 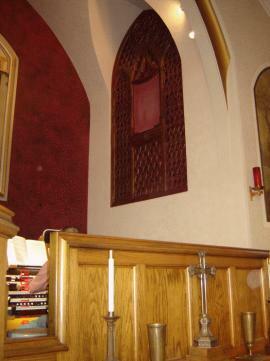 The organ console and right hand pipe chamber can be seen in this view. 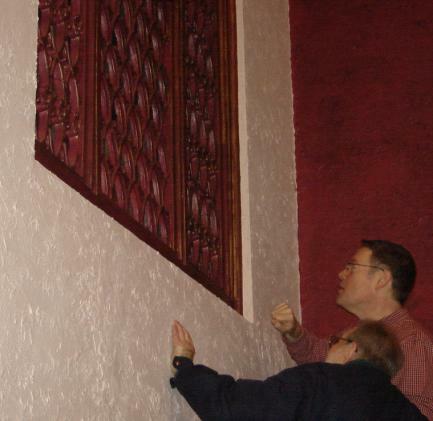 Divergent views seemed to be attended to by MaryAnn Balduf and Terry Jankowski, at the antiphonal console in the balcony. A view toward the balcony. Note the pipe chamber in the center and the antiphonal console on the right. OHSers pay attention as MaryAnn Balduf plays. Steven Ball and Ken Holden pay close attention to the Barton registration. 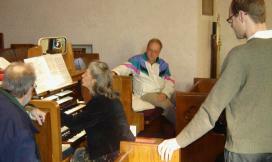 The November 2009 meeting of the Michigan Chapter of the Organ Historical Society convened at St. John United Church of Christ in Wyandotte, Michigan. Present were Carl Balduf, MaryAnn Balduf, Steven Ball, Eric Hartz, Kenneth Holden, Terry Jankowski and Steve Schlesing. 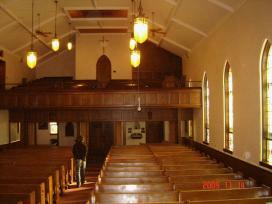 Except for the sexton, who graciously allowed the group to enter, there were no representatives of St. John UCC present. 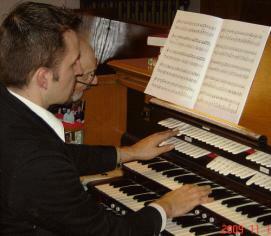 Although presented as a Barton Church Organ, the group was disappointed that the Barton consoles were no longer extant. Instead, the main console appeared to be of the type manufactured by Organ Supply Industries, while the antiphonal console, in the balcony, appeared to be from Moller. Although a stop list was not available, the theatrical sound was typical of Barton. 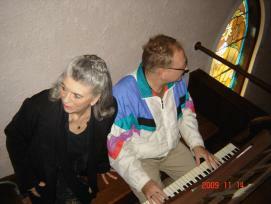 The organ and the building were very well maintained. Following the investigation of the instrument, Balduf called the Chapter meeting to order at 10:55 a.m. The minutes of the October meeting were approved as the first order of business. 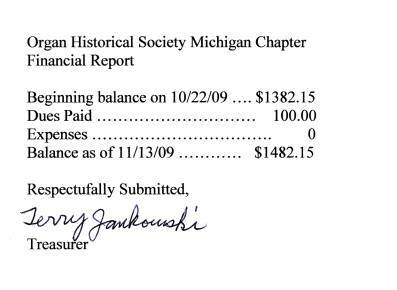 Treasurer Terry Jankowski then presented the treasurer's report, which can be found below. There was no old business. New business consisted of a motion, by Steven Ball, that meeting start times be moved from 9:30 a.m. to 9:55 a.m. The motion was seconded and carried by a unanimous vote. Treasurer Jankowski then received dues from several members, the names of whom he will pass along to Membership Chairman Diane Hiltner. The meeting was adjourned at 11:10 a.m., at which time the group had an excellent lunch at RP McMurphy's Pub in Wyandotte. Lunch and good cheer were had at RP McMurphy's Pub in downtown Wyandotte. Left to right are Carl Balduf, MaryAnn Balduf, Steve Schlesing, Eric Hartz, Steven Ball, Terry Jankowski and Kenneth Holden. Following a brief history lesson by Steve Ball, the group sang a hymn to conclude the exploration of the Barton organ attributes. Ken Holden and Steve Schlesing peer through the swell shades. Steve Schlesing makes a pointed remark.